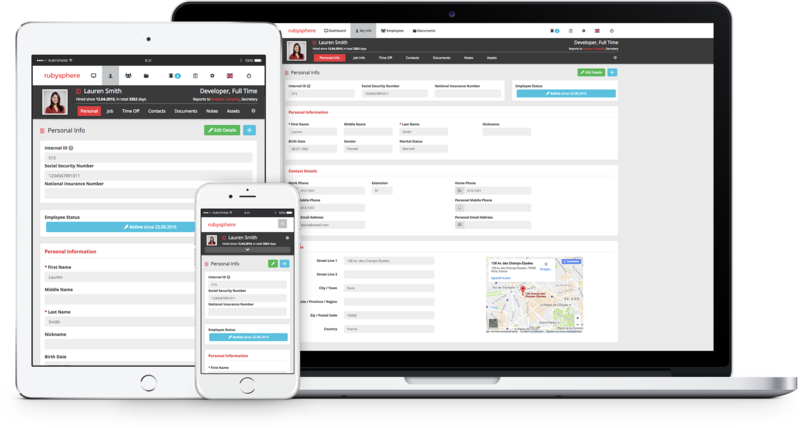 HR Software delivered from the cloud. Free for up to 3 employees. Nothing to install, maintain or backup. RubySphere can be used from any device with an Internet connection. Opt for a cloud-hosted solution and reduce your business costs by eliminating on-site software maintenance, sensitive hardware, disaster recovery issues, updates causing disruption and expensive licenses. Nearly 84% of organizations have reduced their software and in-house infrastructure costs since their migration to cloud-based systems. Choose an HCM platform delivered from the cloud and increase the agility and flexibility of your business. The RubySphere self-service is fully customizable, available to all employees in your company and can be used with any computer, smartphone or tablet.